Prevent rabbits and other animals from eating your young plants by covering them with these Panacea Rustic Wire Garden Cloches. This set of six, generous metal domes handily protects a few of your favorite crops or flowers, while allowing both sunlight and water to reach them. The 12" diameter base of each unit accommodates a small or medium plant easily, and the four extended legs install into soil for stability. Each dome extends 20" tall for a wealth of growing room, and the chicken wire body furthers the pioneer motif in your garden. Vertical metal rods help form the top dome, and dual, 6.5" rings begin the flared shape of each piece. A smaller, 1.25" top ring makes it simple to lift the cloches for harvesting or pruning, and the brown color of each unit meshes with your plants. 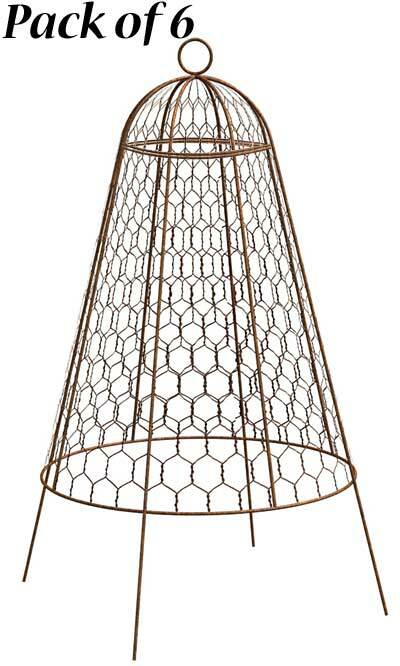 Protect a few of your favorite herbs or crops from animal damage with these Rustic Wire Garden Cloches. Note: This case pack includes 6 of the Panacea Rustic Wire Garden Cloches, 20"H each.